OK... Let's address airport security lines. You’re packed and ready for your trip. The short explanation here is you should become a trusted traveler and get signed up for TSA PreCheck. And if you don't do that, at least check in at home. You need to start planning your strategy for getting through those security lines. And how to pack in general. Now what can you do to get through those lines as easily and quickly as possible? TSA Pre✓™ You can hope to get randomly selected for TSA Pre-Check when you check in... or you can choose to sign up. See our page on trusted traveler programs for details on that. With TSA Pre✓™ you will get into faster lines... you can leave your shoes and jackets on, and your computer and plastic bags for liquids stay in your carry-on. Check on online... you can do this 24 hours to flight time. If you print your boarding pass at home is you can head straight to security and not have to stop at the ticket counter.... at least if you have a carry-on bag! Hopefully you have or can get your seat assignments. If you’re traveling on an airline like Southwest, you’ll get to board in an earlier boarding group and grab a better seat. 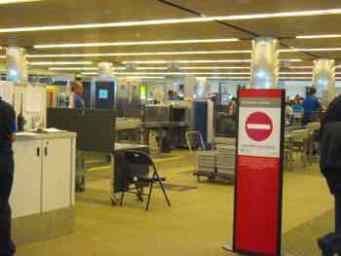 In larger airports, head for the farthest out-on-the-side checkpoint. Generally these tend to be used less than the ones in the middle so the lines should be shorter. This will speed you through faster even if you have Pre-Check. In the U.S. the Transportation Security Administration (the TSA) actually has a list that will tell you the quickest security line at any airport... look them up online. Once you get to the front of the line, just go along with the drill. If you’re a seasoned traveler, you know what to do... you probably have Pre-Check, so just speed on through. If you’re a novice, watch what the others are doing and follow their lead. The TSA agents will also tell you what to do. Empty your pockets of loose change. Cell phones and sometimes watches should go in the bin. Your "one quart clear plastic bag" of liquids each 3 oz or less must come out of your carry-on bag. Remember, one plastic bag per person. The European equivalent is a one liter bag with 100 ml of liquids. Your laptop must come out too unless you have one of the new TSA approved laptop bags that allow x-ray machines to get an unobstructed view of your computer without removing it. You might want to consider investing in one... or getting TSA Pre-Check. Have your boarding pass available and wait for the security agent to wave you through. Now you have to put yourself back together. Hopefully you've allowed plenty of time for this process, and you're not trying to rush to catch your flight. Make sure you've picked up everything you've put in the bin. You don't want to leave anything behind. Get it all put back where it belongs, and make sure it's secure. Double check yourself before you rush off. You have plenty of time and you don't have to run.